Be grateful for what beauty flowers… one day at a time. If you feel you are at the bottom of a well and cannot look up or get out because you are stuck in a rut take heart that you are beautiful indeed. Do not let circumstances get so on top of you that you forget your own inner beauty and strengths for it is these that shall pull you out of where you are now and see you soaring again. It may be a good idea to take a break, have a rest and clear your mind of all thoughts and I have just the thing to take your mind off problems you may be stuck on at the moment. Take a look at the black void which is behind the rose filled with what looks like raindrops moving in front of it. I know rain falls down but take a good look at these white drops and see if they are falling up or down. Does this image appear to be moving up or down to you? If it is moving down try to turn the vision to the image so that the rain drops are moving upwards. This is one way to trick your mind that your circumstances are getting lighter and you are now about to turn the tide of whatever is holding you back in making the changes you desire. 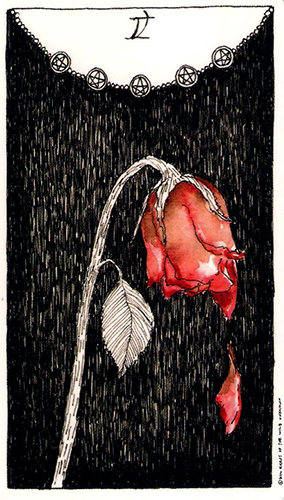 The beauty of the rose in this card is undeniable and it may be that you are so swamped in emotions and worries that you are denying yourself your own inner beauty to shine out and therefore feeling like the rose in this image… a bit forlorn, tired but nevertheless greatness and beauty that cannot be denied. Today’s card — Five of Pentacles — comes from the Wild Unknown Tarot by Kim Krans. Used by generous permission. You can purchase this amazing deck directly from her website or from a variety of stores listed there. Please also visit and “like” the Wild Unknown Tarot Facebook Fan Page!